The EWI IP-101 is a 1/4" TRS balanced patch cable suitable for professional applications. 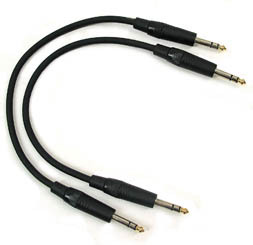 This cable is made from the same EWI Starline tm cable stock that regular Starline tm mic cable is made from; however, it is equipped with 1/4" TRS ends rather than XLR ends. This patch cable is suitable for interconnects between electronic equipment equipped with 1/4" TRS balanced connection jacks. 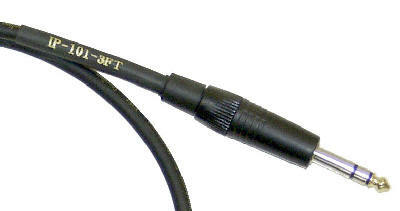 Of course, this TRS patch cable will generally work in most applications requiring a 1/4" TS cable as well. The EWI Starline tm cable, is made up of two strands of 24 ga. 99.98% high copper purity main conductors plus 95% coverage braided shield. 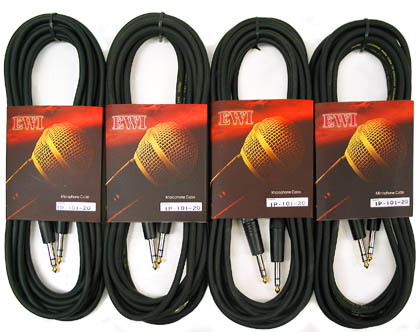 The IP-101 cable is equipped with EWI P292S-BKG connectors, which have a black anodized shell and gold plated anode. This cable offers decent noise rejection and yet is extremely flexible. The PVC jacket adds to the flexibility and is resistant to tangling. Medium grade professional balanced 1/4" TRS interconnect cable. Typically used to patch between mix consoles and drive racks, interconnections between effects devices, or amplifier connections. IP-101-0.5: 0.5 ft, 0.18 lbs. IP-101-1.0: 1 ft, 0.20 lbs. IP-101-1.5: 1.5 ft, 0.24 lbs. IP-101-3: 3 ft, 0.26 lbs. IP-101-5: 5 ft, 0.32 lbs. IP-101-10: 10 ft, 0.55 lbs. IP-101-15: 15 ft, 0.75 lbs. IP-101-20: 20 ft, 0.95 lbs. IP-101-25: 25 ft, 1.15 lbs. IP-101-30: 30 ft, 1.30 lbs.